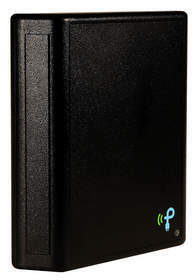 Powercast Corporation today announced its TX91501 Powercaster(TM) Wireless Power Transmitter which uses the 915-MHz ISM band to transmit common radio waves for power and data in commercial, industrial and defense applications. As the power source for Powercast's RF energy-harvesting wireless power solution, the TX91501 broadcasts power and data over 40 feet to its companion Powerharvester(R) receivers. Embedded into micro-power devices such as wireless sensors, instrumentation and controls, the Powerharvester receivers convert the received RF energy into DC power for battery-free operation or to wirelessly trickle charge batteries. The receivers also output the data broadcast from the TX91501 as well as the received signal strength indication (RSSI). Initial versions of the TX91501 transmitter will broadcast a unique ID for device authentication or location-tracking applications, while future versions will also transmit data such as timestamps for end-device synchronization and control. Powercast's TX91501 transmitter is approved by the FCC (Part 15) and Industry Canada. It can be used to broadcast RF energy for both power and data in numerous energy-harvesting applications such as environmental monitoring, building automation, energy management and industrial monitoring. The RF signal uses Direct Sequence Spread Spectrum (DSSS) modulation for power and Amplitude Shift Keying (ASK) modulation for data. The TX91501 is available in versions with an output of 1 watt or 3 watts Effective Isotropic Radiated Power (EIRP). The 6.75" H x 6.25" W x 1.63" D transmitter includes an integrated 8dBi directional antenna with a 60-degree beam pattern, and the unit mounts easily on either vertical or horizontal surfaces using one of two DC power jacks (bottom or back) and multiple mounting holes. The TX91501 operates immediately when powered on and requires no user configuration or programming. An internal shut-off mechanism automatically stops transmission when objects come close to the device, and an LED indicates transmission status. Broadcasted RF energy creates a perpetual power source, unlike potentially unreliable solar, heat or vibration energy sources, to provide power-over-distance, one-to-many charging, and controllable wireless power (continuous, scheduled or on-demand). A wire- and battery-free power source enables zero-maintenance devices which deploy to inaccessible locations, and embeds within sealed devices for use in wet or harsh environments. While a 3 watts wireless power system isn't suitable for an application like EV battery charging, it is interesting to consider the increasing potential of this technology as it scales up in power capacity. The 1-watt ($235) and 3-watt ($300) versions of the TX91501 Powercaster transmitter are available through Powercast's authorized distributors.